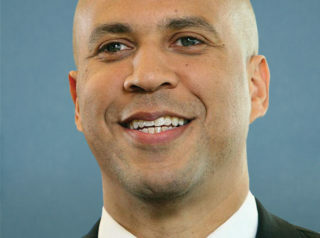 Cory Booker was born on April 27, 1969 in Washington, DC. He earned a bachelor’s degree in political science from Stanford University in 1991, a master’s degree in sociology from Stanford in 1992, and a JD from Yale Law School in 1997. Booker then served on the Newark (New Jersey) City Council from 1998 until 2002, at which time he ran for mayor of Newark but lost the Democratic primary to the incumbent, Sharpe James. In 2001, Booker began a five-year stint working for the Jersey-based law firm of Trenk DiPasquale. He left the firm in 2006 when he was elected mayor of Newark, an office he went on to hold for seven years. On October 16, 2013, Booker won a special election for the newly vacant U.S. Senate seat that Frank Lautenberg had occupied until his death four months earlier. Booker continues to serve in that post and is a member of the Congressional Black Caucus. During Booker’s tenure as mayor of Newark, the city experienced stratospheric levels of crime, poverty, and corruption. Most notably, Booker was the board chairman of the Newark Watershed Conservation and Development Corporation, a nonprofit group that was paid more than $10 million annually to run the city’s water infrastructure. When the state comptroller and the Newark Star-Ledger investigated Watershed in 2013-14, they discovered that it was routinely spending money in a profligate manner, awarding no-bid contracts to friends and cronies of the mayor, reaping the benefits of no-bid contracts awarded by the city of Newark, and using taxpayer money as a giant slush fund—at a time when budget shortfalls were forcing the city to lay off police officers and to depend, for its very solvency, upon tens of millions of dollars per year in state aid. For details, click here. Booker’s prevarications have extended also to matters beyond finances. Indeed he has earned a reputation for repeatedly telling emotionally charged, highly detailed, and self-serving yet fictitious personal anecdotes during his political speeches. Click here for details. In June 2013, Booker was disturbed by a Supreme Court ruling that struck down a provision of the 1965 Voting Rights Act (VRA). That provision had required mainly Southern states to undergo—based on the anachronistic presumption of their continuing racist tendencies—special federal scrutiny before they could be permitted to change their election laws in any way (e.g., by instituting Voter ID requirements or reconfiguring their voting districts). “I think discrimination is still real and evident in voting in … [how] district lines are drawn or where they put polling places,” said Booker, “and I think there’s still a need, frankly, for vigilance and protections under the law.” In June 2015, Booker joined a number of other U.S. senators in introducing legislation to restore the VRA provision in question. Among the issues on which Booker has been most outspoken is immigration. He supports the passage of the DREAM Act and strongly favors a pathway-to-citizenship for the millions of illegal aliens currently residing in the U.S. In December 2013, Booker joined fellow New Jersey Senator Bob Menendez in a 24-hour fast designed to draw attention to the need for comprehensive immigration reform. During his tenure as Newark mayor, Booker refused to allow his city’s police department to “play an I.N.S. function” and enforce immigration laws. “We are not to be running around doing interrogations about whether someone is documented or not,” said Booker. In August 2017, Booker was one of only four members (all Democrats) of the Senate Foreign Relations Committee (SFRC) who voted against legislation designed to cut U.S. funding to the Palestinian Authority until it stopped making payments to the families of Islamic terrorists who had been killed or wounded while waging jihad – payments that amounted to some $300 million annually. The bill passed through the SFRC with bipartisan support, by a margin of 17-to-4. In April 2018, Booker was one of 12 U.S. senators who sought to punish the Sinclair Broadcast Group – widely perceived as a conservative media company – which (a) consisted of 193 television stations and 614 channels in 89 markets nationwide, and (b) had recently announced plans to acquire the Tribune Media Company’s 42 TV stations in 33 markets, a merger that, if completed, would extend Sinclair’s reach to 72% of all American households. The twelve senators included Booker, Independent Bernie Sanders, and 10 other Democrats: Tammy Baldwin, Richard Blumenthal, Maria Cantwell, Edward Markey, Jeff Merkley, Patty Murray, Tina Smith, Tom Udall, Elizabeth Warren, and Ron Wyden. At a Netroots Nation conference in early August 2018, Booker posed for a photograph with Leah Muskin-Pierret, who: (a) was a former member of Students for Justice in Palestine; (b) had contributed to the legal defense fund for the convicted Palestinian terrorist Rasmea Odeh; and (c) was now the head of government affairs for the U.S. Campaign for Palestinian Rights (USCPR), a highly influential pro-BDS (Boycott, Divestment, & Sanctions) organization. In the photo, Booker was holding a sign that said, “From Palestine to Mexico, all the walls have got to go” — a USCPR slogan advocating the dismantling of the security barrier built by Israel during the Second Intifada. In mid-September 2018 — one week before the Senate Judiciary Committee was scheduled to vote on President Trump’s nomination of Brett Kavanaugh to serve on the U.S. Supreme Court — Senator Dianne Feinstein tried to derail that nomination by publicly floating allegations wherein California psychology professor Christine Blasey Ford — a pro-Democrat, anti-Trump activist — claimed that the 53-year-old Kavanaugh had groped her at a party 36 years earlier, when both were in high school. Senator Booker, for his part, vociferously sought to delay the Kavanaugh confirmation hearings until more could be learned about the incident in question. Then, on September 20, a number of media outlets reported that in 1992, Booker himself, during his days as a graduate student at Stanford University, had written a column for The Stanford Daily in which he acknowledged that at a party on New Year’s Eve of 1984, at the age of 15, he had fondled an intoxicated female friend. In October 2018, Booker proposed the creation of “opportunity accounts” which, as a means of reducing wealth inequality in the United States, would give taxpayer money to children from poor families for the first 18 years of their lives. “It would be a dramatic change in our country to have low-income people break out of generational poverty,” Booker told an interviewer from Vox.com. “We could rapidly bring security into those families’ lives, and that is really exciting to me.” In a bill titled the American Opportunity Accounts Act, Booker proposed that every U.S.-born child be given a savings account seeded with $1,000 at the time of his or her birth. That account would then be supplemented by as much as $2,000 annually until the age of 18, with children from poorer families receiving more than children from more affluent homes. Booker’s office estimated that the average black child would accrue $29,038 by age 18, as compared to $27,337 for the average Latino child and $15,790 for the average white child. On February 1, 2019, Booker officially announced his candidacy for the Democratic Party’s 2020 presidential nomination. On January 29, 2019, Booker reacted reacted with immediate, horrified outrage when media outlets nationwide reported that “Empire” television actor Jussie Smollett, an openly gay African American, was claiming that he had just been victimized by a hate crime perpetrated by two white men who allegedly had assaulted him, poured bleach on him, draped a rope around his neck, and shouted “This is MAGA country,” along with a variety of anti-black and anti-gay slurs. Upon hearing this story, Booker tweeted: “The vicious attack on actor Jussie Smollett was an attempted modern-day lynching. I’m glad he’s safe.” Moreover, the senator called for the passage of an anti-lynching law. On February 14, 2019, Booker and fellow Senators Kamala Harris and Tim Scott (a black Republican) asked for unanimous consent on the Senate floor to pass the Justice for Victims of Lynching Act, legislation that would criminalize lynching for the first time in U.S. history. The motion was passed. For an overview of Booker’s positions and voting record on a variety of additional key issues, click here. For additional information on Cory Booker, click here.